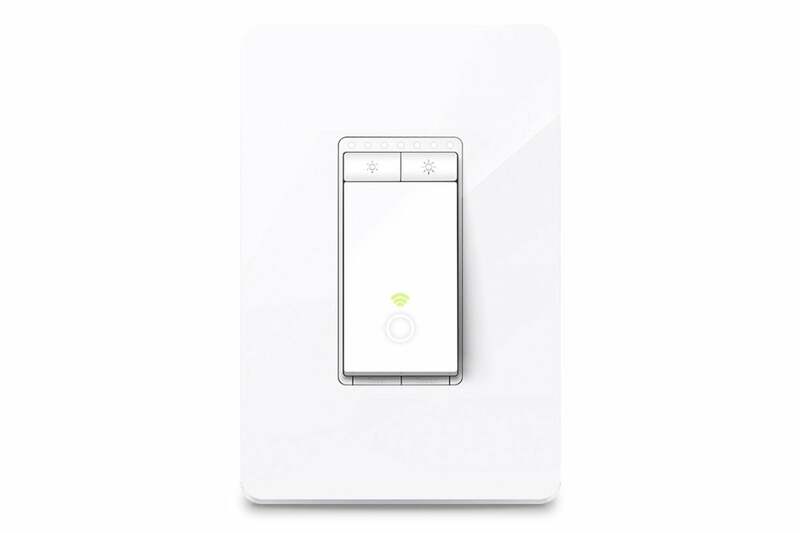 I’ll cut to the chase: TP-Link’s Smart Wi-Fi Light Switch Dimmer (model HS220) is an in-wall switch that looks good and works well. Let’s start with the good looks, as I must say I really like what TP-Link has done to the face of this devicer. A large rocker switch occupies the bulk of the real estate. 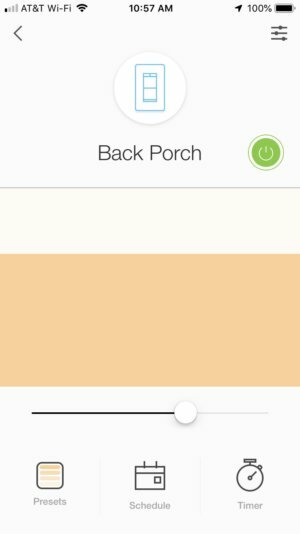 A quick tap turns the light on or off, gradually brightening or dimming the connected bulbs. 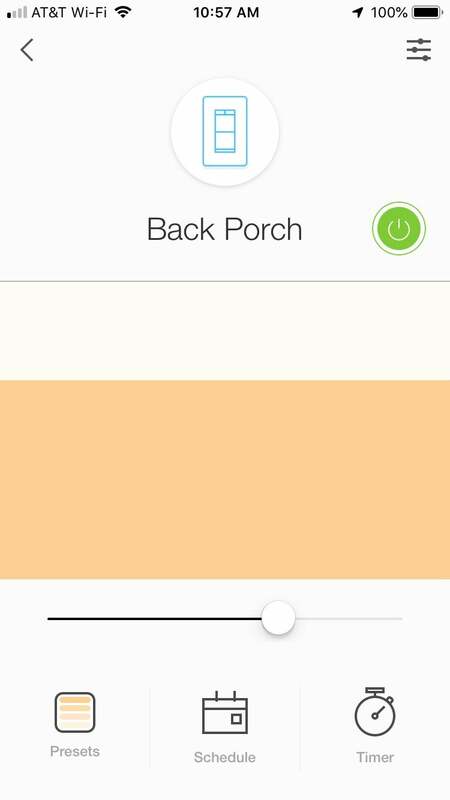 A tap-and-hold immediately takes the bulb to your preset maximum brightness or quickly shuts it off. Two smaller buttons above this rocker can be set to the aforementioned maximum brightness, and they can be used to manually brighten or dim the bulb when it’s turned on. A row of LEDs above these buttons gives you a visual indicator of that brightness setting, so you don’t need to eyeball it by gauging the brightness of the light fixture directly. Another LED placed inside the paddle itself offers color-coded information about the switch’s Wi-Fi status. The monstrous switch plate is tough to get aligned on the wall, and even tougher to tweak. While the switch itself is well designed, I was less enamored with the wall plate. It’s larger than usual—measuring 5 x 3.25 inches, compared to a standard 4.5 x 2.75 inches—and while that might not sound much bigger, it makes a significant difference to the eye (in fact, it’s 31-percent larger by surface area). As well, like most smart switch plates, it simply snaps on top of the base unit to hold it in place. But getting the base unit adjusted just so, in order to get it straight and level with the plane of the wall, is tricky. Get it wrong and the wall plate will stick out on one side, and since it’s so big, this is particularly noticeable. You have but one chance to get this right: Once you snap the wall plate on, it’s seemingly on for good. My first alignment wasn’t perfect, but when I tried to remove the plate to try again, it bent wildly without letting go. I eventually gave up, certain that the plate would break before releasing its hold. The electrical design is also somewhat unusual. 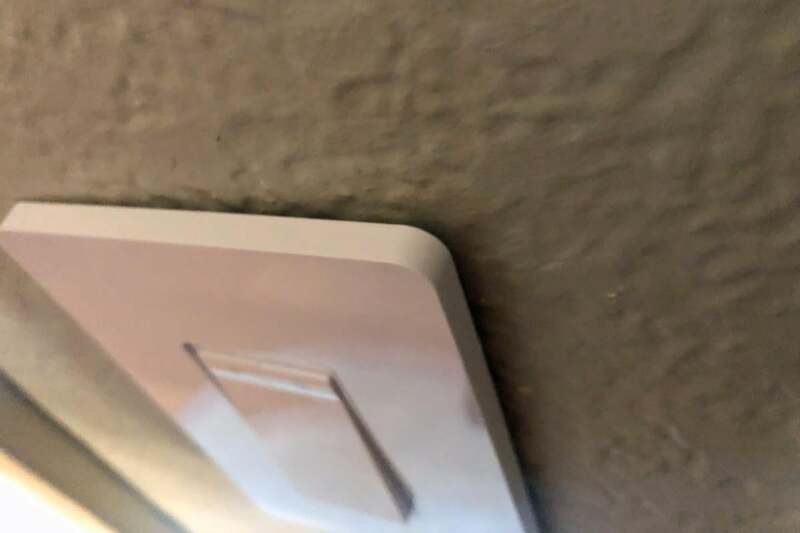 Most in-wall smart switches have screw terminals that you wrap your from-the-wall wires around (sometimes accompanied by back stabs that you can push your solid copper wires into, instead), or they have wire pigtails that you join to your in-wall wires using wire nuts. The TP-Link HS220 uses both terminals and pigtails. You’ll connect your line and load wires to terminals on the side of the device, and connect your neutral (required) and ground wires to the switch’s pigtails using wire nuts. It’s not a bad design decision, as it helps reduce the number of wire nuts that consume precious space inside the junction box. Status LEDs on the top of the dimmer give you a quick indication of your brightness level. Though the switch does not actually carry Kasa branding, it does require TP-Link’s Kasa app to run. And as with TP-Link’s other smart switches, outlets, and smart bulbs, the app sets up easy and works without complaint. Setup involves the usual temporary Wi-Fi access point connection, after which the Kasa app takes over. Things here are pretty simple, letting you power on/off, set brightness level, and assign preset levels on the fly. A simple scheduling and timer system gives you access to easy vacation controls. You can easily brighten or dim the lights with a flick of your fingertip. The switch can also be grouped with other Kasa family devices to streamline much of this, and support for Amazon Alexa, Google Assistant, Microsoft Cortana, and IFTTT are all included. I had zero trouble with any of the switch’s operations or interactions. 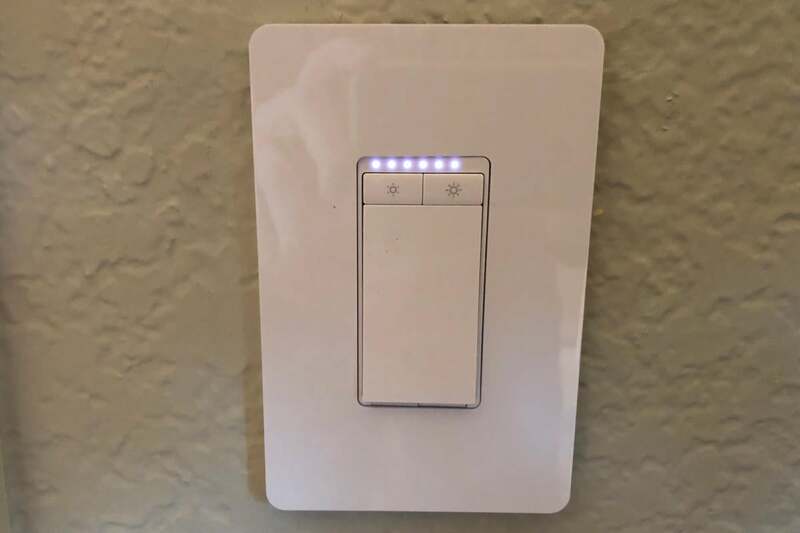 With a street price around $45, the HS220 is less expensive than many smart dimmers, including the $75 C by GE C-Start (which has an onboard motion sensor), the $60 Wemo Wi-Fi Smart Dimmer, (which supports Apple’s HomeKit technology, where the Kasa HS220 does not), and the $55 Lutron Caséta Smart Lighting Dimmer Switch (which also supports HomeKit, but requires a Wi-Fi bridge for smart home integration). One of the other features that these competitors offer, however, is the ability to work on three-way circuits: The Kasa HS220 is strictly for single-pole setups. TP-Link’s Wi-Fi-ready switch works as well as it looks—provided you don’t care about HomeKit support or mind the monstrous cover.